“The Absolutely True Diary of a Part-time Indian” carries strong themes of racism and perseverance. The theme of racism is topical and will probably be for the foreseeable future; but, it is not why I love this book. The theme of perseverance is what really connected with me and got me invested in what was going on in the story; this theme connected with me because I am currently going through high school and seeing someone go through conflict and coming out of it better than when he went in was extremely inspiring. It might not be as inspiring to people not in my situation, but the other themes are just as well developed. So you might have noticed that I laser focus on the themes; well, that’s what I am going to do for the rest of the piece, and occasionally I will gush about how the themes play into the story and add to the overall impact of the novel. This work stands out for two reasons: first, the work’s author is a well-regarded creator because of his effective use of a dark tone in his stories; second, because it talks about serious topics, including racism but also the more tangible problem of alcoholism (which affected the author’s life and that of his tribe). The general premise of “The Absolutely True Diary of a Part-Time Indian” is that a young man who has been raised on the reservation for his entire life realizes that his school can not help him, so he goes to another school. In this new school, he gains self-confidence and flourishes. It’s a lot more complex than all that, but that is the general gist of it. The themes can be represented by the protagonist’s position in two power systems: his school and the reservation. The goals of “The Absolutely True Diary of a Part-Time Indian” are as follows: first, to talk about several themes, including segregation, racism and perseverance; second, to make a story about this kid and his struggles. On the subject of whether or not the story accomplishes those goals, the short answer is yes. This book did it by quickly and effectively giving the reader an easy way to understand the themes in the form of the reservation and high school’s social systems. 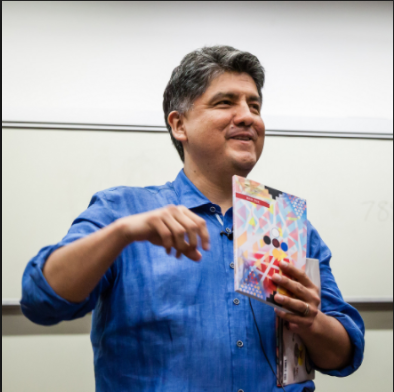 The author, Sherman Alexie, of “The Absolutely True Diary of a Part-Time Indian” is avowedly influenced by his childhood. He has gone through some problems like depression and alcoholism. Alexie’s childhood is very similar to the character in the book. The book’s tone is similar to his previous books, meaning it’s funny, depressing and dark. This author typically portrays a journey where a character experiences pain and gains clarity. This book doesn’t break with that formula: the main character experiences pain and gains clarity; however, the fact that he is going through such a familiar thing is heart-breaking and makes the story personal. The dark tone might put off some readers; it nearly made me stop reading. The exhaustingly dark tone is offset by the sheer charm of the protagonist. He is enjoyable to read about and likeable in a way that makes you want to see him get past his struggles and go on to bigger and better things. The story also has intricate symbolism. The main symbols that the theme is built around are the school and reservation; more specifically, the protagonist’s place in their social structure. I could see how the themes interacted with the story, and I reacted with excitement because something was changing, and then I proceeded to cry because this story is really sad. The story is really sad, and that would often turn me off of a book, but this is different. It is different because it paces itself so the characters aren’t tortured before I am invested. Let’s talk about that: it’s really interesting because when a story starts to focus on the pain of the characters it usually becomes less enjoyable; but, in this situation, it was just the natural progression of the story. I believe I stay invested through all the drama because the story primarily focuses on how the protagonist heals and becomes better instead of how they wallow in pain. The most surprising thing to me is that the drama is entertaining. The drama-laden ending was emotionally draining and left me satisfied instead of just tired and depressed. Near the end of the book, there was just a cascade of depressing events, which just exhausted me; however, even though misery happened, a lot of the events got resolved in a positive way, which just made me happy. All in all, “The Absolutely True Diary of a Part-Time Indian” is an emotional thrill ride that keeps your attention with a likable protagonist. It definitely fulfills the goal of being entertaining. Now, did Alexie achieve his goal of tackling serious topics like racism and alcoholism? Well, yes, but it is confusing at times. At times, the symbolism that is supposed to convey the message is either muddled or is too complex for me.